The following example will create an e-commerce system using an Ecommerce Form Page. The e-commerce system will contain an Asset Listing of fruit that is for sale and a SecurePay Direct Post Payment Gateway to allow users to pay for their purchases. The items in this store will be created as Standard Page assets and tax and location-based delivery fees will be charged on each item. Tip: Remember that you must Commit any asset changes that you make. 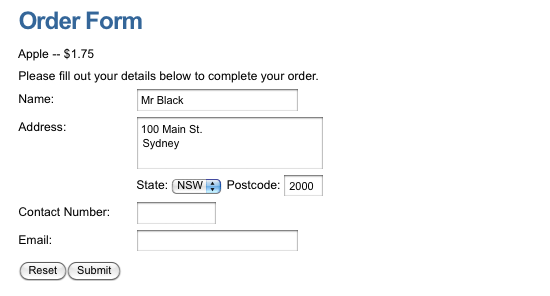 Add an Ecommerce Form Page under your Site in the Asset Map, titled Order Form. Right click on the Ecommerce Form Contents asset in the Asset Map and select the Form Contents screen. The fields on this screen are similar to those on the Form Contents screen of a Custom Form. 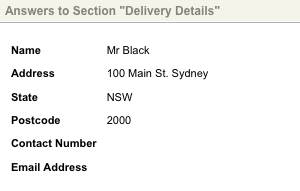 Create a new Section under the e-commerce form, called Delivery Details. A Section asset will appear in the Asset Map. Add six questions to the Delivery Details section: two text type questions, a select type question, two numeric type questions and an email Address type question. These questions will appear on the Details screen of the Delivery Details section, as shown in the figure below. Right click on the Question 1 (text type) asset under the Delivery Details section in the Asset Map and select the Details screen. In the Title field, enter Name. Click Commit. The name of the asset in the Asset Map will change to Name. Right click on the Question 2 (text type) asset under the Delivery Details section in the Asset Map and select the Details screen. In the Title field, enter Address. Click Commit. The name of the asset in the Asset Map will change to Address. Right click on the Question 3 (select type) asset under the Delivery Details section in the Asset Map and select the Details screen. In the Title field, enter State/Territory. Click Commit. The name of the asset in the Asset Map will change to State/Territory. Right click on the Question 4 (numeric type) asset under the Delivery Details section in the Asset Map and select the Details screen. In the Title field, enter Postcode. Click Commit. The name of the asset in the Asset Map will change to Postcode. Right click on the Question 5 (numeric type) asset under the Delivery Details section in the Asset Map and select the Details screen. In the Title field, enter Contact Number. Click Commit. The name of the asset in the Asset Map will change to Contact Number. Right click on the Question 6 (email address type) asset under the Delivery Details section in the Asset Map and select the Details screen. In the Title field, enter Email. Click Commit. The name of the asset in the Asset Map will change to Email. Create a Folder under your Site, titled Items. Underneath this folder, add five Standard Page assets titled Apple, Orange, Peach, Pear and Watermelon. Once you have done this, the five assets will appear in the Items Folder in the Asset Map, as shown in the figure to the right. These assets will act as the items on our e-commerce store. To set up these items, a Metadata Schema must be applied to the Items Folder with the price and taxation information. Create a Metadata Schema under your Site, titled Item Information. Add a section to the Metadata Schema and two Text fields titled Price and Taxability. Right click on the Apple item asset under the Items Folder in the Asset Map and select the Metadata screen. In the Price metadata field, enter 1.75. In the Taxability metadata field, enter YES. Right click on the Orange item asset under the Items Folder in the Asset Map and select the Metadata screen. In the Price metadata field, enter 1.49. Right click on the Peach item asset under the Items Folder in the Asset Map and select the Metadata screen. In the Price metadata field, enter 2.65. Right click on the Pear item asset under the Items Folder in the Asset Map and select the Metadata screen. In the Price metadata field, enter 2.35. Right click on the Watermelon item asset under the Items Folder in the Asset Map and select the Metadata screen. In the Price metadata field, enter 2.99. Create an Asset Listing Page under your Site, titled Buy Our Fruit. On the Details screen, select Standard Page in the Asset Types to List field. The items will now be listed on the Buy Our Fruit page, as shown in the figure below. The listed items now need to be able to be added to the Ecommerce Form Page. Right click on the Asset Listing Page's Default Format Bodycopy in the Asset Map and select the Edit Contents screen. Tip: You will need to replace <asset_id> with the Asset ID of your Ecommerce Form Page. This allows the item asset to link to the e-commerce form. Now that the items have been listed and linked to the Ecommerce Form Page, the e-commerce form needs to be able to source the price and tax information and a tax rate needs to be added for the taxable items. Right click on the Ecommerce Form Contents asset in the Asset Map and select the Details screen. In the Tax Name field, enter GST. In the Tax Rate (%) field, enter 10. In the Price Source field, enter %asset_metadata_Price%. This will tell the e-commerce form to find the price of the item from its Price metadata. In the Taxable field, enter %asset_metadata_Taxability%. This will tell the e-commerce form if the items are taxable or not by their Taxability metadata. As we have entered YES in the Taxability metadata field for all our items, they will be taxable. On the Details screen, in the SecurePay Account Details section enter the following generic test account details: Merchant ID: ABC001, Transaction Password: abc123. i) Right click on the Ecommerce Form Contents asset in the Asset Map and select the Details screen. ii) In the Linked Gateway field, select the Payment payment gateway. The e-commerce form is now linked to the payment gateway. To add delivery fees determined by the state or territory the products are being shipped to, an E- commerce rule needs to be applied to the State/Territory question. Right click on the Ecommerce Form Page and select the Ecommerce Rules screen. The State/Territory, Postcode and Contact Number questions will be listed on this screen, as they are either Numerical questions or questions with predetermined answers. 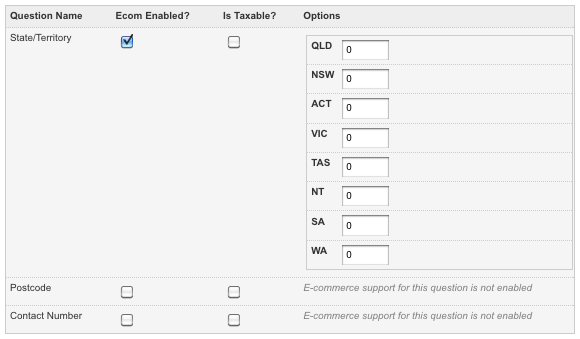 To create a rule for the State/Territory question, select the corresponding tick-box under the Ecom Enabled? column and click Commit. New fields will appear in the Options column, as shown in the figure below. Edit the Options fields of the State/Territory question as follows: NSW and ACT, 4.49; QLD and VIC, 6.55; TAS, NT and SA, 7.25; and WA, 8.99. 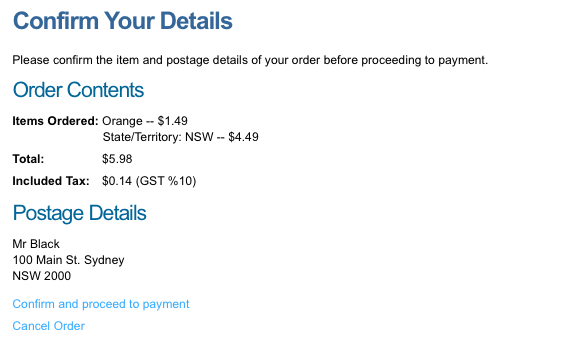 Delivery fees will now be charged depending on the answer of the State/Territory question. For example, if the fruit is being shipped within New South Wales, a delivery fee of $4.49 will be charged, while if it is being shipped to Western Australia the delivery fee will be more expensive, at $8.99. In order to receive the details of the order, a Recipient Email must be sent to the site administrator. Right click on the Ecommerce Form Contents asset in the Asset Map and select the Email Options screen. Navigate to the Recipient Email Format section of the screen. In the To field, enter the email address of the site administrator, for example, admin@squiz.com.au. to the Name and Email questions. 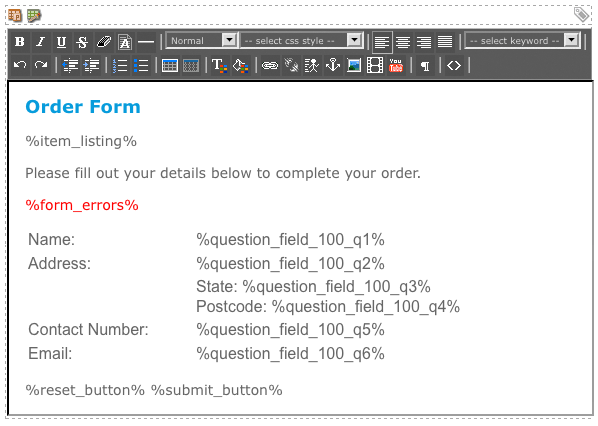 In the Subject field, enter Order #%form_submission_id%. This will display the order ID. This will display the order and form details including the items ordered, total cost and delivery information. You may also wish to configure the Receipt email to send an email to the e-commerce user. To configure the item listing on the form page of the Ecommerce Form Page asset, an Asset List Format needs to be created. Right click on the Ecommerce Form Contents asset in the Asset Map and select the Display Formatting screen. In the Asset List Format field, enter the %item_format% keyword replacement, as shown in the figure below. The %item_listing% keyword can now be used on the Form Bodycopy. As there is no default layout for the form page, the Form Bodycopy must be configured to create a layout for the page. Right click on the e-commerce form's Form Bodycopy in the Asset Map and select the Edit Contents screen. The e-commerce form questions, form errors, reset and submit buttons have been added to the page. The page has been given a heading and a list of the ordered items has also been added. The new layout of the form page is shown in the figure below. 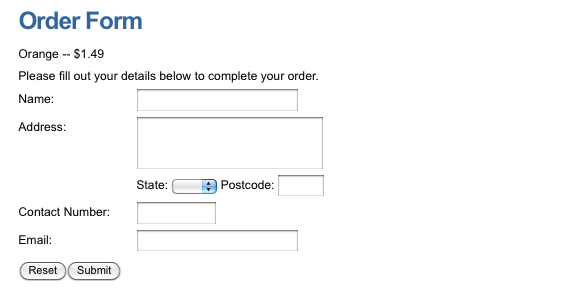 When a user completes the e-commerce form, a confirmation page is shown for them to confirm their information and order details. As there is no default layout for the confirmation page, the Confirmation Bodycopy must be configured to create a layout for the page. Right click on the e-commerce form's Confirmation Bodycopy in the Asset Map and select the Edit Contents screen. The list of ordered items, total price, included tax and form responses have been added to the page. The page has been given a heading and the confirm and cancel buttons have also been added. 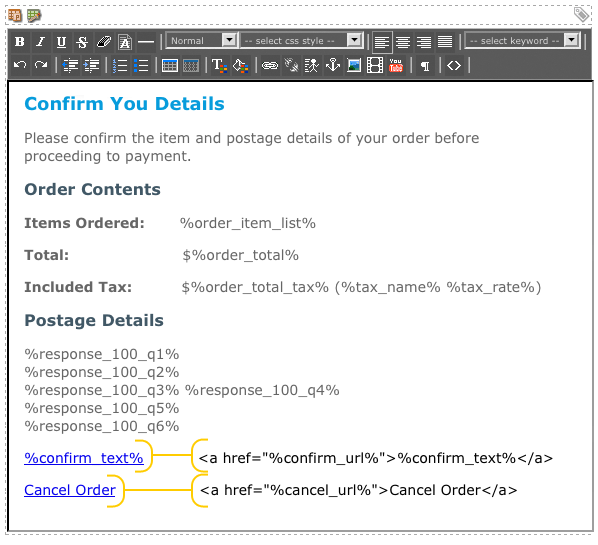 Right click on the e-commerce form's Receipt Bodycopy in the Asset Map and select the Edit Contents screen. A thank you message and form summary has been added to the page. The user will browse the Buy Our Fruit page, as shown in the figure below, and determine the item they want to purchase. 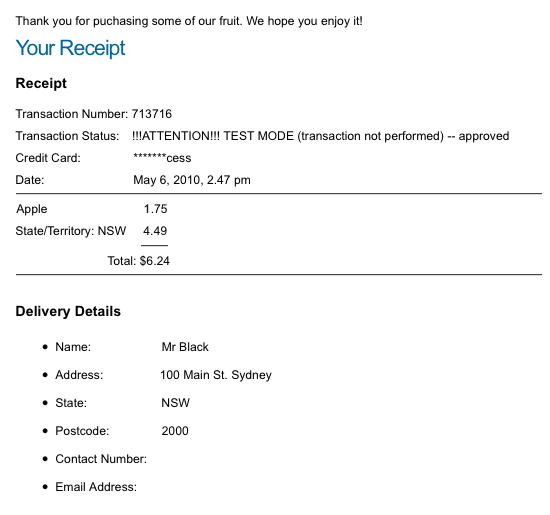 In this example, the user has decided to buy an Apple. When the user clicks on the Apple item, they will be taken to the Ecommerce Form Page where they will fill out their contact details, as shown in the figure below. Once they have completed the form, they will click Submit. The user is taken to the Confirmation Page where they can overlook the details of their order before proceeding to the payment process. The Confirmation Page for this order is shown in the figure below. As you can see, a delivery fee of $4.49 has been applied to the order, determined by the userââââ‚¬Å¡¬™s response to the State/Territory question. 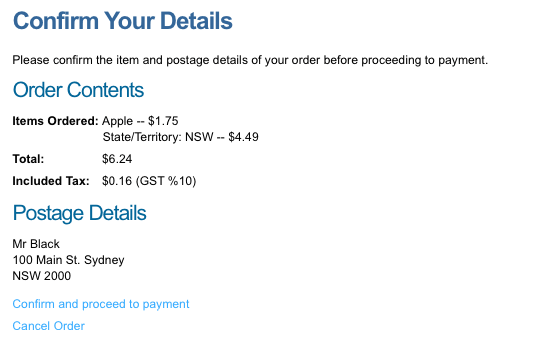 The page also informs the user that the price of the Apple includes $0.16 GST. The postage details completed in the previous step are also listed on this page. When the user is satisfied these details are correct, they will click Confirm and proceed to payment. When the user has confirmed their order details, they will be taken to the SecurePay eSec Payment Gateway, as shown in the figure below. The payment gateway will list the payment that is to be processed and allow the user to select a Valid or Invalid Card Number. Our payment gateway is currently in Test Mode meaning that no payments will be issued. 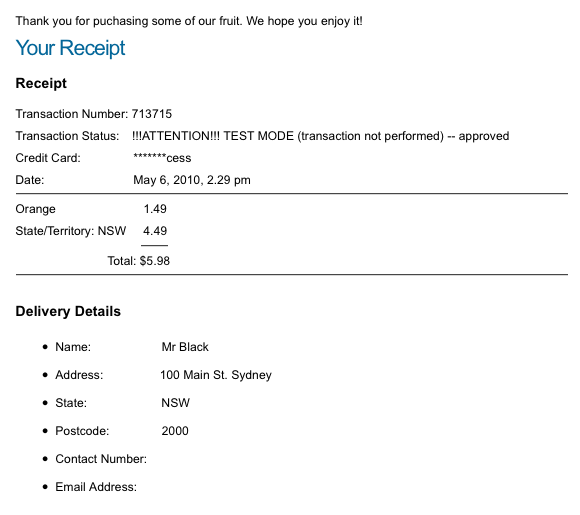 When creating your own, operational e-commerce system, you will need to turn Enable Test Mode to Off on the SecurePay Direct Post Payment Gateway Details screen. For more information, refer to the SecurePay Direct Post Payment Gateway chapter in this manual. When the user completes the payment form and clicks Pay, the payment will process. 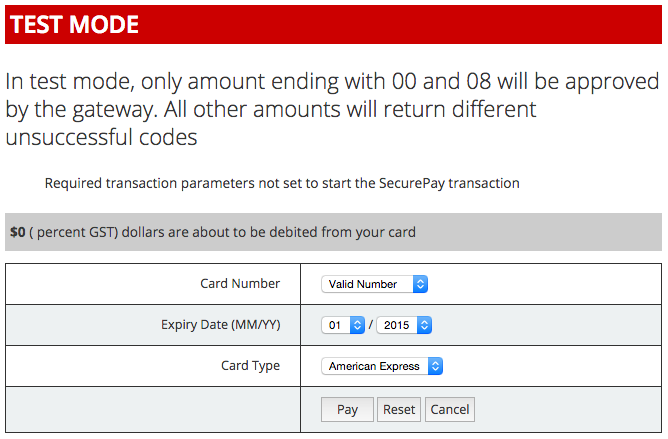 When the payment has been processed and approved, the user will be taken to the Receipt Page, as shown in the figure below. A thank you message and order and delivery details are displayed on this page. An Order asset will appear in the Asset Map with the information the user has entered into the form, as shown in the figures to the right and below. An email will also be sent to the administrator of the site with the order and delivery details. The e-commerce system functions correctly and allows you to choose an item from the item Asset List, complete the e-commerce form and pay for the purchases. Live. For more information, refer to the SecurePay Direct Post Payment Gateway chapter. An Order asset is created and an email is sent to the administrator with the order details.